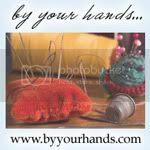 This is an older tutorial I did four years ago but it is still very relevant so I thought I would share it here today. I had the chance to try the plastic hanging bags you see on TV and they did not work at all. These bags do work and I am going to be making myself some this week. They only last for one season because in our climate we have to water every day. 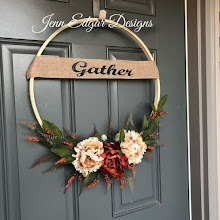 But they are basically free for just a little sewing so well worth the effort to make them. I am always looking for a new way to recycle old jeans. 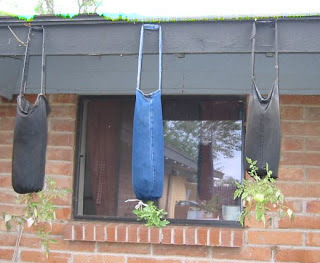 Here is my tutorial for making hanging veggie bags from the leg and waistband from jeans. 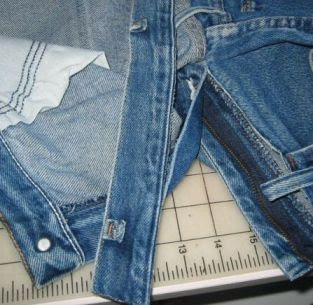 Cut off one lower leg from the jeans, 20 ½ inches long up from the bottom hem. The bottom hem will be the top of the bag and the cut part will be the bottom. Turn the leg inside out. 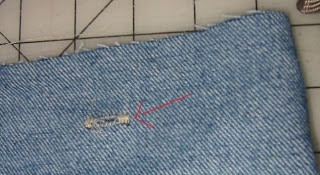 Taper the side seams by measuring in 1 ½ inches at the bottom and tapering up. 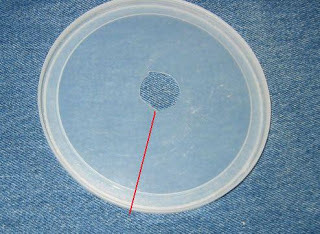 Red line is the sewing line. 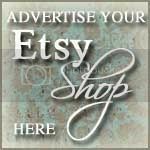 Make a ½ inch buttonhole 1 ¼ inch up from the bottom. 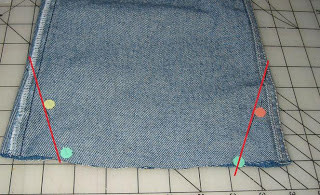 Fold the hem over ¾ inch. 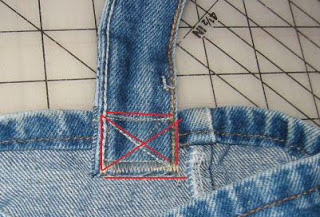 Zig zag stitch the hem, making sure your seam allowance folds over the buttonhole. The buttonhole should be on the outside. Attach a large safety pin to one end of the shoe lace and pull it through the casing. Cut off 28 inches of the waistband for the strap, carefully cutting off the belt loops. 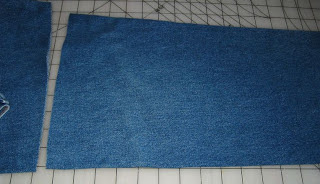 Optionally: Cut a 5 inch wide x 28 inch long piece of denim for a strap. Fold over lengthwise and zig zag the sides closed. 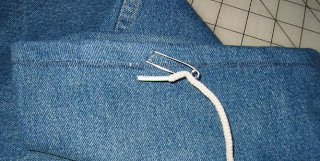 Stitch to the pant leg in the same way as the waistband. Stitch both sides of the strap to the top of the bag evenly. Zig zag along the bottom the of strap and then stitch around the strap and crossways. 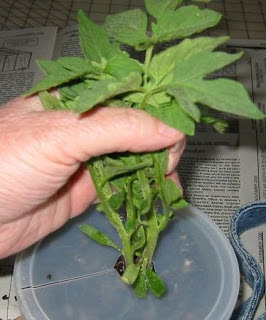 Place the lid around the plant stem. 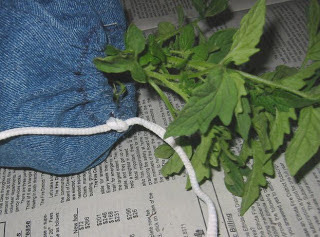 Very carefully gather the leaves together with your hand and place the plant inside the bag from the top and out the bottom. 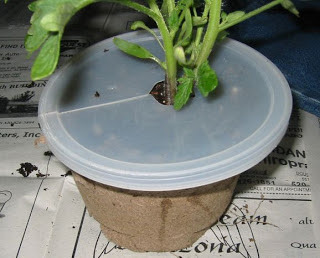 The plastic lid will help to hold the soil in when you water. Gather the bottom up as tightly as you can and tie off. The easiest way to fill the bag is to hang it over a door knob. Fill the bag a little at a time with potting soil making sure you pack the soil tightly so there are no air holes in the soil. You can plant flowers in the top of the bag if desired. 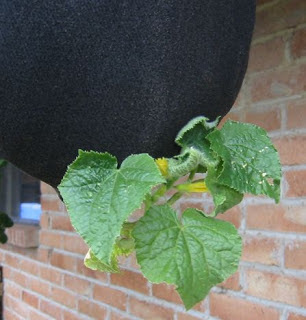 I used a couple of long nails to hang my plants from the house eaves. You can use large hooks if desired. They can be hung from a tree limb, a tall fence post. Wherever they will get maximum sun exposure. I used regular potting soil in the first ones I made and I add plant food every two weeks to the top of the bag. The last one I made I used Miracle Grow potting soil that has plant food in it so I will see which one works better. You will have to water every day if it is very hot out. 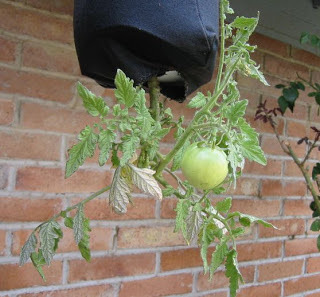 This is a picture of my first tomato in the first bag I planted. I started the tomatoes from larger plants and it took about three weeks for the first tomato to appear. Notice how the plants grow up toward the sun. My cucumber plants were very small and they are just now starting to flower. The plants are still very small so we will see how they do.